Our Rankings, investable indexes, and in-depth financial analysis demonstrate the business and investor case for just business behavior. We have one goal: to drive investment capital toward more just companies, thereby incentivizing a more just and equitable marketplace. Our ongoing financial analysis content series – coined JUST Alpha – explores the connection between just corporate behavior and investor returns. We invite you to explore the in-depth research here to see how and why just companies exhibit lower investment risk and cumulatively outperform their peers, while driving positive change on the issues the American public care about most. 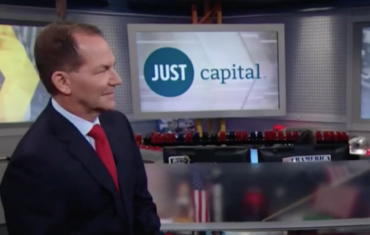 Our flagship index – the JUST U.S. Large Cap Diversified Index (JULCD) – began live trading in November 2016 and tracks the top 50% of Russell 1000 companies ranked by JUST Capital by industry, and is constructed to match its industry weights. It has consistently outperformed the benchmark over that period. 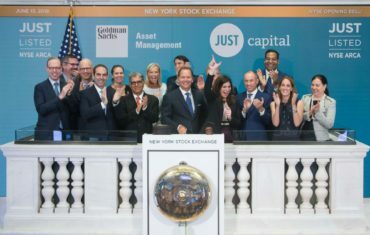 On June 13, 2018, Goldman Sachs Asset Management launched the Goldman Sachs JUST U.S. Large Cap Equity ETF (Ticker: JUST), which seeks to provide investment results that closely correspond, before fees and expenses, to the performance of the JULCD. The JUST ETF ended first day as one of the most successful ESG ETF launches to date. If you would like weekly updates and insights into the JULCD and JUST ETF, sign up for our newsletter here. The information contained herein is for informational purposes only without regard to any particular user’s investment objectives, risk tolerances or financial situation and does not constitute investment advice, nor should it be considered a solicitation or offering to investors residing outside the United States. JUST Capital makes no representation as to the advisability of investing in any investment fund or other vehicle. Shares of JUST are made only by prospectus. The addition, removal, or inclusion of a security in any JUST Capital index is not a recommendation to buy, sell, or hold that security, nor is it investment advice. The JUST Parties do not in any way sell, sponsor, support, promote, or endorse any securities based on the JULCD, or have any involvement in their operations or distribution. Prospective investors should not make a decision to invest in any investment fund or other vehicle based on the information contained in this website, and JUST Capital shall not be responsible or liable for any advice given to third parties or decisions to invest in any investment fund or other vehicle by you or third parties based on the information. Index performance does not reflect the deduction of any fees or expenses. Past results of the JUST U.S. Large Cap Diversified Index are no guarantee of future performance. The JUST US Large Cap Diversified Index is calculated and maintained by FTSE Russell using the Russell 1000 Index as a starting universe, and aims to reflect the performance of a JUST Capital Foundation Inc. methodology. FTSE Russell does not sponsor, endorse, sell, or promote any investment vehicle that is offered by any third party that seeks to provide an investment return based on the performance of any index. It is not possible to invest directly in an index.